A photo of my well worn copy. You can't see it, but many of the pages are littered with notes in the margins with folded over ears. I look forward to meeting Chase in person one day and having it signed. Chase leaves no stone unturned, not only covering all the complexities of becoming a well-respected, professional investigator, but also the handling of the investigation itself. From the conception of the idea to investigate right through to the proper etiquette of closing a case and the storage of that sensitive research material. She is all about preserving the integrity of ALL collected evidence, be it eye witness testimony, actual biological material, or any other type listed and described in her comprehensive book. I have never been exposed to anything remotely close to investigating a paranormal case, but after reading this book I now have a much better appreciation for the seriousness of collecting, researching, and then afterwords being the caretaker of such evidence. Chase outlines an "Investigator's Code of Ethics" in the first chapter, a theme that is followed throughout the book covering the attributes and standards researchers should strive to practice as they go about interacting with witnesses, fellow team members, other field experts, and law enforcement personnel. She also talks about the "Hynek Classification System" benefits versus the "Vallee Classification System" when recording UFO and Contact Reports along with how to go about customizing your own classification system if desired; something I have run across but never fully understood. There is no doubt in my mind, Chase knows exactly what she's talking about, and has given this subject much consideration and respect. I know you hear it all the time, but I wish to urge readers the importance of adding this book to their library. Anyone looking to become a serious researcher, needs to become acquainted with the entire content of Chase Kloetzke's book. It will provide you with a condensed how-to book built from years of invaluable field research and experience, that you will find yourself referencing back to for years to come! 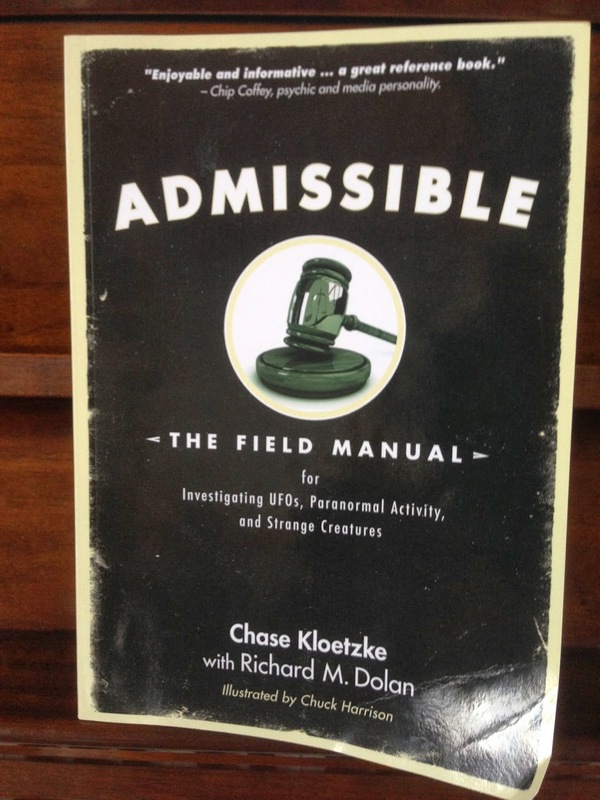 "ADMISSIBLE: THE FIIELD MANUAL for INVESTIGATING UFOs, PARANORMAL ACTIVITY, and STRANGE CREATURES" written by Chase Kloetzke with Richard Dolan can be enjoyed either in "Kindle" format, or paperback at "Amazon.com" , "Create Space.com", and through the publishing company "Richard Dolan Press". To learn more about Chase Kloetzke and the projects she's currently working on, you can join in on great conversations every Thursday starting at 9pm ET in the chat room at KGRA Radio during her 1 and 1/2 hour radio show titled, "The Chase Kloetzke Project". "The Chase Kloetzke PROJECT" show on "KGRA Radio"